Shehla Zia secured women’s legal rights in Pakistan for 35 years, both as a practicing lawyer and in her work with a leading women’s empowerment NGO. Shehla Zia (1947 to 2005) was a trained lawyer specializing in criminal and constitutional law who devoted her energies to securing women’s legal rights in Pakistan for 35 years, both as a practicing lawyer and in her role as a joint director of Aurat Foundation, a leading NGO working for women’s empowerment. Shehla was also director of the foundation’s legislative watch program, which monitors women’s participation in the legislative process. Women’s legal rights were Shehla Zia’s focus from the start of her career. One of Pakistan’s pioneering women lawyers, Shehla received her bachelors in law from Punjab University in the late 1960s. For the next 11 years, she worked as a law associate specializing in women’s legal rights. She then became a partner with a prominent law firm run by women, AGHS Law Associates, where she worked for five years. 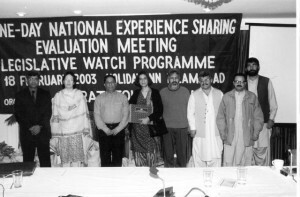 In 1986, Shehla joined Aurat Foundation as joint director, and director of its legislative watch program. Here, she focused on issues including legal and constitutional rights issues of Pakistani women, women’s political education, their participation in the legislative system, gender sensitization for NGOs and federal government officials, and governance issues. Shehla collaborated with other organizations, and contributed to national and international policy debates. She worked in 2001 as a consultant on the review of the women and children’s program of the AGHS legal aid cell. She also prepared labor law booklets for factory women, and provided inputs on womens development for the Eighth National Five-Year Plan. She researched a report on women’s participation in political and public life in Pakistan in 1999, as part of a larger project undertaken by International Women’s Rights Action Watch-Asia Pacific to monitor whether governments had fulfilled their women’s equality obligations. Shehla researched women’s legal position in Pakistan, and the legal and policy framework within which NGOs operate. She contributed to her country’s report to the World Conference for Women in Beijing in 1995 on the issue of power and decision-making and also contributed to a report by a national commission of inquiry on women on political participation, violence against women, and development rights.